Fels Naptha! I had never heard of it until about 15 years ago and now I can’t live without it. My mother introduced me to it when I owned a used children’s clothing store. She told me that both my grandmother and great-grandmother always had a bar in their wash rooms. If you have never used it I suggest that you pick up a bar. You can find it in the laundry isle of most grocery stores and it only costs around $1.00 per bar. This little bar is great for so many things. Check out this list of uses that my family and I have come up with. Bathtub/Shower – to clean, rub a wet bar of Fels Naptha on a sponge and wipe down the tub/shower. Rinse. Grout – to clean, rub a soft brush across a bar of Fels Naptha before scrubbing the grout. Sink – to clean, rub a wet bar of Fels Naptha on a sponge and wipe down the sink. Aluminum – to clean and shine, rub a damp rag across a bar of Fels Naptha and buff the aluminum to a shine. Dish Soap – to make your own, dissolve 1 part Fels Naptha in 2 parts water. Laundry Detergent – to make your own, try this Laundry Detergent Recipe. I have been using it ever since I found out about Fels Naptha and have perfected it over the last 15 years. Poison Ivy – to remove the resin from clothing, wash clothes with some grated Fels Naptha. Pre-treatment – to make your own, dissolve 1/4 bar of Fels Naptha in 2 cups hot water and 1/2 cup vinegar. Pour mixture into a spray bottle. Spray the item and allow item to sit for 1-hour before washing. Shoes – to clean canvas shoes, run a soft brush across a bar of Fels Naptha and brush away the dirt before washing. Baby Formula – to remove, rub the stain with a wet bar of Fels Naptha and soak the item in Borax and water for 30 minutes before washing. Chocolate – to remove, rub the stain with a wet bar of Fels Naptha and soak the item in Borax and water for 30 minutes before washing. Makeup – to remove, rub the stain with a bar of Fels Naptha prior to washing. Oil Based – to remove, rub the stain with a wet bar of Fels Naptha and allow it to sit for 1-hour prior to washing. Wine – to remove, dissolve 1/4 bar of grated Fels Naptha in 1-gallon of hot water. Soak item for 1-hour prior to washing. Whites – to make them brighter, dissolve 1/4 bar Fels Naptha in 1-gallon hot water. Soak the item for 1-hour before washing. Wring Around the Collar – to remove, rub the area with a bar of Fels Naptha, then using a soft brush work the soap into the area before washing. Cold Sore/Fever Blisters – to dry up, wash the affected area with Fels Naptha and rinse. Poison Ivy – to treat, immediately bathe, washing with a bar of Fels Naptha. Deer – to repel, dissolve 1-bar of grated Fels Naptha in a 5-gallon bucket 1/2 full of hot water. In a cheese cloth, put 2 bunches of chopped scallions, 2 heads of unpeeled garlic, 4 eggs (uncracked) and 1 small can of chili powder. Place the cheese cloth in the bucket and crack the eggs. Top the bucket off with more hot water and replace the lid. The the mixture sit for 1-week then pour it into a sprayer. Spray the area that you want to keep the deer away from. Reapply every 2 weeks or after it rains. Beware, this smells nasty! Insecticide – to kill bugs, dissolve 3 tablespoons Fels Naptha in 1-gallon of hot water. Allow mixture to cool before spraying on plants. Repellent – to keep bugs away, cut Fels Naptha into 1-inch pieces and place them at the base of your plants. Hides – to tan, dissolve 1 bar of grated Fels Naptha for each gallon of water. Heat the mixture over low heat until it reaches a boil. Allow the mixture to cool before submersing the hide in the gelatinous liquid. Allow the hide to sit in the mixture for 1-2 months. I love this little series you've been doing… So many neat uses for things I wouldn't necessarily have otherwise tried! Hope you have a great week, Robin! Thanks for all the great tips, Robin! I remember my grandmother and mother always had a bar in the laundry area, yet some how I had forgotten about this soap! I even remember stocking the shelves with this when I worked at a small grocery story as a teen. 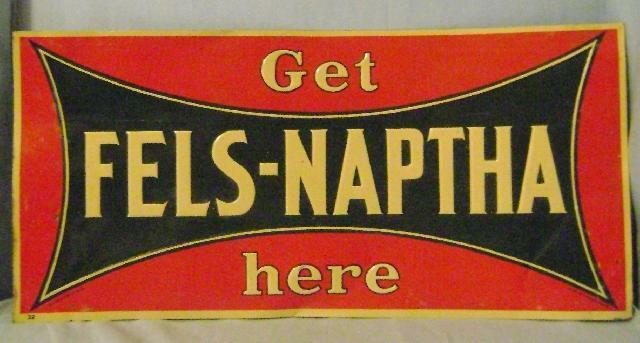 I am going to buy a bar of Fels Naptha, which I can't believe has been around since 1893. It is nice to see an old time product still around! We used to use this all the time camping in Girl Scouts. I would love for you to share and link up at my TGIF Link Party. The party opens Thursday night and closes on Wednesday night at midnight. These are great tips!! Thanks for sharing this at Domestic Superhero today! I'd love it if you shared it at Living Well Spending Less this week for our Thrifty Thursday party! I think my readers will love it! I haven't heard of it, I'll keep my eyes open! Stopping by today from Thursday's Favorite Things. I'm loving this series. This one I have never heard of. My husband works in the oil field and says naptha is like acetone or kasane head gasoline. lol I told him I didn't think you would have that in your laundry room. 🙂 I'll have to look for it. Thanks for the smile. So glad you joined us this week at Transformed Tuesday. He’s right! Previously (until the ’60s, maybe ’70s), cleaning solutions had naphtha in them. But in addition to possibly being flammable, there was the concern about people getting high from smelling it. So nowadays, the “naptha” in the name of this soap is just a nod to history. I love it! Not only is it so useful, but the wrapper looks vintage. I have an unopened bar in my laundry room just for display. Thanks for sharing with SYC. I use Fels Naptha for stain removing but never knew about all these other uses! Thanks for linking them up to Think Tank Thursday. I featured you today. Wow, I had no idea this could be used for so many things. Thanks so much for the inspiration! I love your series. I've learned so much from it! Thank you so much for sharing at A Bouquet of Talent this week! Have a wonderful Memorial Day weekend. What a great series. I hope you can keep it going. I haven't been able to find Fels Napa locally for about 5 years now. If you have allergies, beware of this soap. I had to leave the room when I opened the Fels Naptha. I really wanted to use it. But, I could not breathe, then started wheezing. Too bad. Just got my first bar and love it! I was wondering if you had any luck with finding your notebook? I like the soap for my laundry. I found a bar of it at my local dollar store in the dollar isle. Cheap and works amazing. I really like this soap. I used it once to remove a huge red wine stain from a favorite light colored sweatshirt of mine, and after several washings and applications it completely came out! It’s works like magic on so many different stains.